Born in Paris, Dominique Bayart came to San Francisco in 1975. In 1979 she obtained a Master's degree in World and Comparative Literature from San Francisco State University. Ms. Bayart has worked in the arts for over twenty years, beginning as an airbrush artist. In 1980, she founded a successful screen-printing company, DB2002, which specialized in architectural and promotional graphics for major department stores, the Academy of Sciences, architects and designers. In 1989, Ms. Bayart co-founded Bayart and Rae Furniture, which developed unique contemporary pieces of limited edition furniture for residential and commercial environments. Ms. Bayart and her partner used a broad range of materials such as steel, aluminum, copper, hardwoods, glass, mica and leather to create elegant designs that were both inventive and functional. Characterized as "industrial chic" in Focus magazine (October 1993 issue), each piece of furniture was created after a thorough research of material possibilities, form and function. Bayart and Rae was represented by Randolph and Hein, Agnes Bourne and The Bradbury Collection. 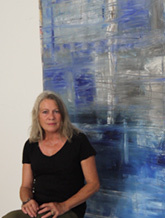 Since 1997 Dominique Bayart has devoted full time to monotype printing and painting. Her strong understanding of colors was developed during her years of experience in screen printing. Her sense of architectural compositions comes from a thorough study of form and function which she learned in furniture design. Joseph Bueys: "To make people free is the aim of art therefore art is for me the science of freedom." This is why I paint. Prior gallery representation: PIECES GALLERY, Healdsburg, Ca. ; CFA Gallery, San Rafael, CA. ; THE SIMMONS GALLERY, Sutter street, S.F. CA.